Poems were introduced by David Lloyd James, with readings by John Masefield (Poet Laureate at the time), Edith Evans, John Gielgud, John Laurie, Flora Robson, Edith Evans, Dylan Thomas, Valentine Dyall, C. Day Lewis, Walter de la Mare, T.S. Eliot, Edith Sitwell, and Louis MacNeice. The organizing committee consisted of George Barker, Walter de la Mare, John Lehmann, C. Day Lewis, Louis MacNeice, none other than Henry Reed, Denys Kilham Roberts (Chairman), Vita Sackville-West, Edith Sitwell, Dylan Thomas, and Lawrence Whistler. Previously, we posted about how this particular poetry reading impacted the career of Vita Sackville-West. ideal for that game where you add the phrase 'in my pants' to the end of a sentence. "Do You Not Father Me (In My Pants)," "Incarnate Devil (In My Pants)," "From Love's First Fever to Her Plague (In My Pants)." The force that through the green fuse drives the flower in my pants! That's better than singing any of Emily Dickinson's poems to the tune of the theme from "Gilligan's Island." 'Someone's boring me. I think it's me.' 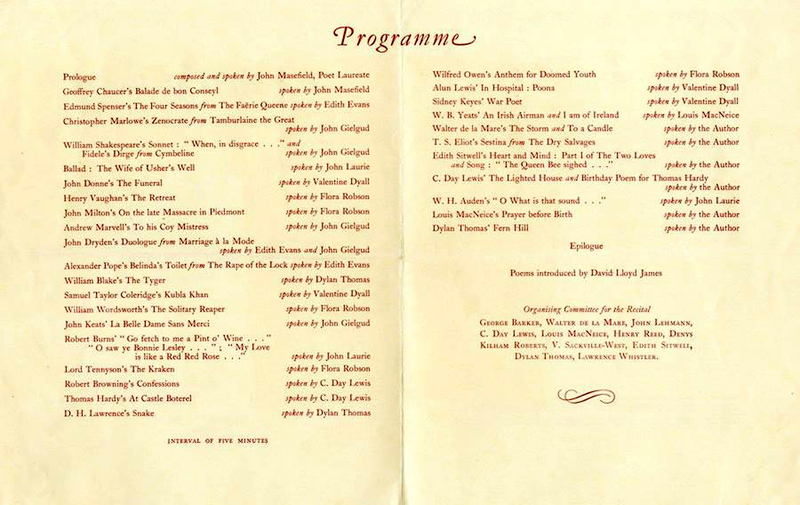 Dylan Thomas recorded dozens of hours worth of spoken word performances for Caedmon Records, starting with the album A Child's Christmas in Wales and Five Poems, in 1952. To celebrate a half-century of spoken word publishing, Caedmon (now part of HarperAudio) has published an eleven-CD set of the complete recordings, Dylan Thomas Unabridged. The collection includes his most famous poems, "Fern Hill" and "Do Not Go Gentle Into That Good Night"; prose works such as Adventures in the Skin Trade and Quite Early One Morning; as well as his final play, Under Milk Wood. Disc 5 of the set contains Thomas reading two poems by Henry Reed: "Naming of Parts," and "Chard Whitlow" (right-click and select "Save as" to download .mp3s). Although I am dismayed they could spell neither Reed's name nor 'Whitlow' correctly. Thomas' interpretation of Reed's poems is superb, if a little heavy on the satire. He even does a passable impersonation of T.S. Eliot. I can't be sure without checking a good Thomas biography, but I think the link above may be the exact recording Sitwell is referring to. By the way: this opening speech, "A Visit to America—An Irreverent Preamble", is flipping hysterical.